You are invited to explore the Observatory website. Join the "Friends" to be in on special events and lots more. especially on the Mountain top! You'll really enjoy the Blog posted by 'Clear Sky Scott'! Scott Kardel is the Public Affairs Coordinator for the Palomar Observatory. He presents the wonder of astronomy and the Observatory to a great many people in a very fun but educational way. One day when we started remodeling our home in Oceanside, three ladies came to the door wondering what we were doing with 'their' house. Their family was the first owner of the home so they'd lived here when they were very young. They told us that their father had collected stones from all over, including Palomar Mountain, to build the fireplace. 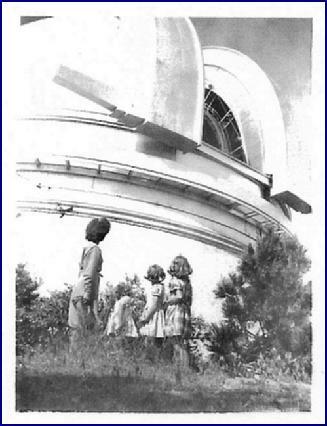 When we said that we had a cabin on Palomar, they told us a story about the Observatory. Vista Way had to be widened from Hill Street for the truck to make the turn taking the lens to the Mountain. 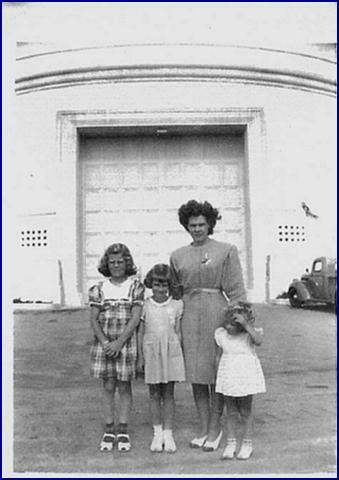 When the lens was being transported to the Observatory, the whole family went down to Hwy 101 and watched the lens go by -- they said it was like a parade. The girls said that their mother told them to remember this day for the rest of their life, it was a very special day for the girls. "There were lots of people on the corner that day watching the lens go by. It was standing upright, on edge, in the truck and went very slowly and carefully around the corner. It was a spectacular thing to see even as a little child, to have the realization that this is was an awesome thing. Living just a few blocks away from that corner, I have often thought of that special day as I pass through the intersection. The road is still wider in that area. It was a very exciting to later go to Palomar and realize I saw the lens on the way to the Observatory." Here is a copy of my article, which finally ran this past Sunday in the Union-Tribune. As you will see, they only used one of the pictures I provided, the one sent me by the observatory. They chose to omit the other photo, even though I referred to it in my article. I'm sorry about that, but it's something I have no control over. As you'll see, they did use the quotes I got from Patricia, which I thought added a lot to the article. Thank you both again for all your help. I enjoyed presenting this bit of history to the readers of the U-T. Thanks for forwarding the story about the "mom" to all of us. I found it particularly interesting because many years ago (like about 1950) my parents were friends with one of the first couples that took care of the observatory. Their names were Ferd (not Fred) and Gladys Feryan. He did the maintenance at the observatory and she was the "mom" in the monastery for the astronomers. One day they offered to take our family on a tour of both buildings. Since I was a kid I didn't appreciate all the details like my folks did, but I still remember the tour very vividly. All of the mountain didn't have electricity then but they did at the monastery (a generator perhaps??) so that Gladys could have a large deep freeze to store food. She never knew how many guests would be in attendance and needed to be prepared. She also loved cooking for the men. The Feryans lived on Bailey Meadow Road in the cabin by the big water tank. Nice memories. Your comments, photos and additions to this website are always welcomed.